I found this book incredibly engaging despite not being a dedicated geiko fan like many in the forums. Komomo's voice comes through the translation very well and lets you gain a sense of what her daily life as a maiko and then a geiko is like. The real strength of the book lies in its candid photographs taken by Naoyuki Ogani. Ogani has documented Komomo since she was fourteen or fifteen, even before she had decided to become a maiko, up to after her erikae and becoming independent (around 21 or 22). 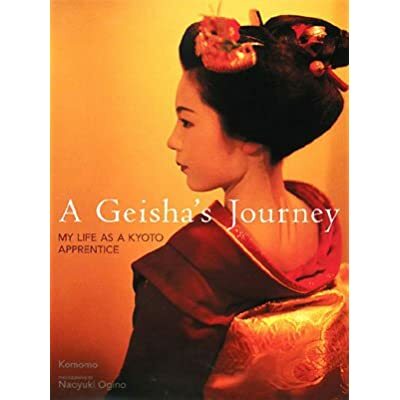 I would definitely recommend this book to anyone who is interested in learning a bit more about geiko in a non-painful way. And of course for Komomo fans this is probably an autobuy. -People looking for in depth information about maiko and geiko kimono, kanzashi, dances, etc. I have this book too and really liked it. It was the personal story I was looking for, without the need for a novel (like that of Mineko or others). Lots of personal touches and insights to her life, from when she was young. Ogino-san's pictures are such a lovely journalistic style; I'm so happy that he saw potential for this project and that her family was accommodating (he went to live with them in China). Some of the content is also in Kateigaho International Magazine, 2006 Spring edition (I think). She's on the cover. I forgot to say how moved I was when I saw the picture of Komomo in a rickshaw for her erikae. One of her customers had hired it so she wouldn't have to walk to each of the 40 or so teahouses to make her greetings like she had when she became a maiko. It just seemed so considerate and nice, it warmed my heart. I also soon realized ozashiki are completely different for geiko and maiko. Maiko are often seen as just stereotypes; nobody bothers to look beyond the make-up to the real person beneath. A geiko, on the other hand, is seen as an individual with a name and a unique personality. For a maiko, the most important thing is to match the image that people have of us, but as a geiko, it's okay for us to let our own character show. After all my worry about becoming a geiko, I finally felt liberated.